Since Oprah Winfrey’s $7 million giveaway of Pontiac G6 sedans back in 2004, the words “you get one, and you get one, and so do you” have become nigh impossible to forget. 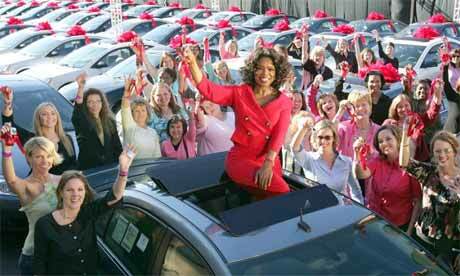 Today, Oprah may repeat the 2004 giveaway – only this time – the vehicle to be given away is rumored to be none other the Chevrolet Traverse. To further solidify the Traverse giveaway rumor, promotional sweeps of today’s episode (available here) show a few Traverses being driven into the studio. At this point, it’s unknown how many units of the Traverse will be given away and whether the promotion will go on for the entire week or be a one-day deal. Either way, it sure is a great (but slightly expensive) promotional and buzz-generating tool. What’s more, we expect today’s Traverse giveaway to kick off an all-new ad campaign for the Traverse. The large CUV launched in 2008 and is finally getting some real competition from the likes of the all-new Ford Explorer. According to sources, GM marketing chief Joel Ewanick is behind the new Traverse adverts. If you’d like, tune in today at 4 PM Eastern. For channel and air information, check your local listings on the Oprah listings page here. Previous story Advert: Chevrolet Cruze Is The New Kid… But Should It Lay Low?